All day today I was working on a story about St. Joseph's Day. I will link to it when it runs in the paper! I have strong feelings for St. Joseph. 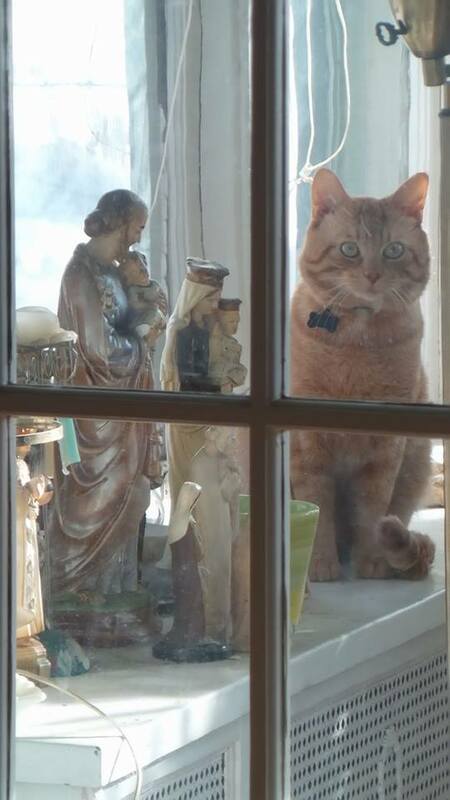 Maybe it goes back to when I bought that statue at that estate sale in Amherst. That statue is still here in my home. St. Joseph has been making new friends as you can see from this picture. When I got home today I just had to have Italian food. I went and got out one of my old coffee table Italian cookbooks. I loved these cookbooks. There was a series of them and I would get them at Barnes & Noble. You could find them in the discount section, probably because I was the only person in the world who would actually cook out of them. The "Italy" cookbook in this series was by Lorenza di Medici, a cookbook author I loved because I had another book she wrote, another coffee table book I must point out, on Italian cooking. Again I could not imagine anyone else cooking out of this book. I would have it propped up on the counter behind plastic so I wouldn't spill anything on it. Howard laughed at me once when he came home and there I was with this insane beautiful book, trying to cook out of it. Anyway tonight I made di Medici's recipe for Seppie in Zimino. It is Squid With Vegetables! "In Zimino" means "with vegetables." You learn something new every day! Being German I had to sub in a little green cabbage, I admit, because I did not have the spinach that was called for. Otherwise I think I am in the ballpark. I would like to get back to cooking more out of these cookbooks. I was 10 pounds skinnier back when I did. This kind of food is good for you. One other thing happened today that I must note. At one point I was in the home of these two Italian sisters, and with a friend from church who is also Italian, Sicilian. And I began talking about Leonard Pennario. And I Could. Not. Stop. It is amazing this still happens to me. I have been on this project for so long. I am kind of embarrassed about it because the world at large does not know that things like this sometimes take so long to complete, especially when you have this all-consuming full time job. I do not mention him every day on the Web log on account of that. But it still happens. There is something beautiful in that, you know? And there is something beautiful about this Seppie in Zimino.